Getting a pay raise while sitting on the couch? Sign me up! Thanks Omega for the dividend increase! April has typically been a big month for dividend increase announcements among my FI Portfolio holdings. Last year saw 7 total increases, although I'm only expecting 6 this year with 2 of them already boosting up my pay. On Thursday of last week the Board of Directors at Omega Healthcare Investors (OHI) announced an increase in their dividend payout. The previous dividend payment was $0.62 and the new payout is $0.63. That's a 1.61% increase from the prior payout. 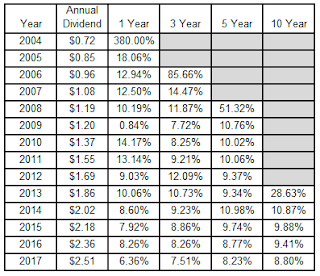 Assuming the dividend is at least maintained at this level for the remainder of 2017 this will represent 13 consecutive years of dividend growth giving them the tile of Dividend Contender. Shares currently yield 7.31%. The raise appears to be rather unimpressive; however, there's much more than meets the eye. While most companies that pay and grow dividends announce increases just once a year, Omega Healthcare prefers to give a smaller raise each quarter. Compared to May 2016's dividend of $0.58 the year over year increase jumps all the way to 8.6%. Omega Healthcare has increased dividends for 20 consecutive quarters dating back to the August 2012 dividend. Since I own 79.484 shares of Omega Healthcare Investors in my FI Portfolio this raise increased my forward 12-month dividends by $3.18. This is the 2nd consecutive year with a dividend increases that I've received since becoming an owner in early 2015 and the 8th consecutive quarterly increase. Cumulatively OHI has increased my dividends by 17% over that time. According to US Inflation Calculator the rate of inflation over that same time is 2.9%. Omega Healthcare Investors has had a truly remarkable run with their dividend growth. 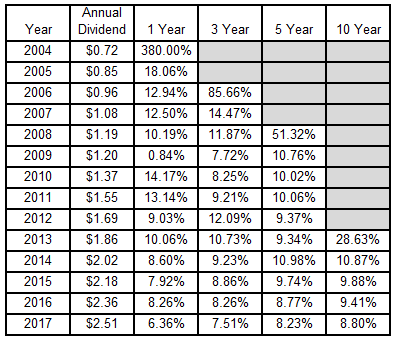 It's not often that you find companies that typically trade at 6%+ dividend yields that are also growing the dividend at 8%+ per year. **2017's dividend assumes 2 more payouts at the new $0.63 per share per quarter rate. My forward dividends increased by $3.18 with me doing nothing. That's right, absolutely nothing to contribute to their operations. Based on my portfolio's current yield of 2.93% this raise is like I invested an extra $108 in capital. Except that I didn't! One of the companies I own just decided to send more cash my way. Thus far in 2017 I've received 15 dividend increases from 13 companies held in my FI Portfolio increasing my forward 12-month dividends by $75.85. My FI Portfolio's forward-12 month dividends increased to $5,631.39. Including my Loyal3 portfolio's forward dividends of $69.28 brings my total taxable accounts' dividends to $5,700.67. My Roth IRA's forward 12-month dividends remain at $286.41. Do you own shares of Omega Healthcare Investors? 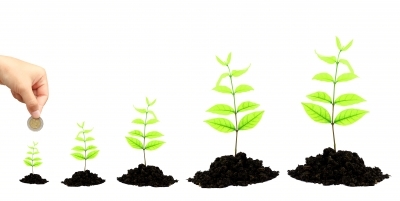 Do you prefer all of your raises at once or 4 smaller increases throughout the year? I like the 4 small raises a year concept they do. Hope they can continue it for a few decades lol.